My daughter loves horses and dreams of owning one of her own someday (for now she just loves on the ones at the local horse rescue). As you can imagine her room is filled with horse books which include everything from storybooks to horse care manuals. One of Gwyn's favorite horse authors is Jessie Haas. We own a few of her books and frequently check them out from the library too. If you have a child who enjoys the American Girl series her name may look familiar, because she is the author of the Saige books. Jessie has written over 35 books which include picture books, early readers, middle grade, YA novels, poetry, nonfiction and history for adults. Recently we received copies of her Bramble and Maggie early reader series to review which Gwyn has already read multiple times. 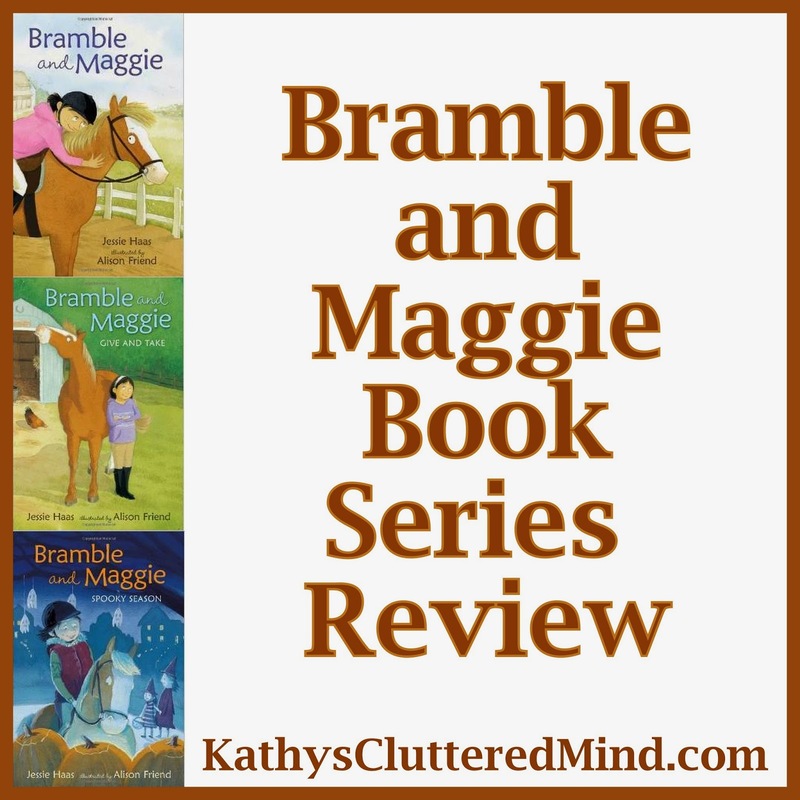 We received the entire Bramble and Maggie series to review which includes 3 books - Bramble and Maggie Spooky Season, Bramble and Maggie Horse Meets Girl and Bramble and Maggie Give and Take. Spooky Season is the newest book in the series and was released this Fall. These books are early reader chapter books and are geared towards children in grades K-3. Each hardback book is 52 pages with 3-4 chapters. The text is large and easy to read and the gouache style artwork is bright, colorful. Gwyn is 8 years old and a new reader. I honestly I am not sure what reading level she is at, but she was able to read the books with very little assistance. The sentences are simple and short so they don't frustrate new readers. There were some words that were new to Gwyn so she did some assistant with those. The series is about a persnickety, but lovable horse named Bramble and her patient owner Maggie. The books are fun, engaging and teach important lessons on character traits, friendship, fear as well as horsemanship. This is the first book in the series and the book where Bramble meets Maggie. In the story Bramble decides she is done providing riding lessons...going around in a circle all day is no fun. So her owner Mrs. Blenkinsop decides to put her up for sale. But Bramble is really picky and on a mission to find the perfect girl. Things don't go so well and eventually the sale sign is changed to a free sign. But as fate would have it Maggie sees the sign and asks her parents if she can meet Bramble. Maggie knows she shouldn't fall in love with the first horse she sees, but after she meets Bramble and rides her she immediately does just that. Bramble also falls in love with the patient little girl. With her book in hand Maggie gets everything perfectly set up for Bramble's arrival. When Bramble arrives at Maggie's house she is scared and Maggie must show patience once again to help Bramble get used to her new surroundings. In this book Maggie decides to take Bramble for a ride. But first she needs to get Bramble prepped....which takes awhile because Bramble isn't being cooperative. After consulting her book Maggie realizes she needs to practice, "give and take." In the story Bramble also meets the neighbors, visits the beach for the first time and makes a new unlikely new friend. This is the newest book in the series. The story takes place around Halloween and Bramble gets a little spooked at all the new sights and sounds. First she encounters crinkling, crunching leaves, loud geese overhead, acorns bombing rooftops, scampering squirrels and scary scarecrows. But thanks to her patient owner she soon overcomes her fears. That is until Halloween day comes...and with it even more fears, real and pretend. Can Maggie trust Bramble to brave the tricks and lead them both to safely to the treats? I guess you will have to read it to find out! I really hope Jessica creates more Bramble and Maggie books. Every night when I go in to check on Gwyn she has the books laying on her bed, which is a clear sign she loves them!! I liked the book a lot. I like to read them every night. I like them because they have a horse in them. They are about friendship. If you are looking for a way to further enhance these 3 great books then you will love the free downloadable curriculum guide. This guide includes discussion questions and activities for each book as well as some cute bookmarks. Jessie Haas has written more than twenty-five books, most of them about horses. 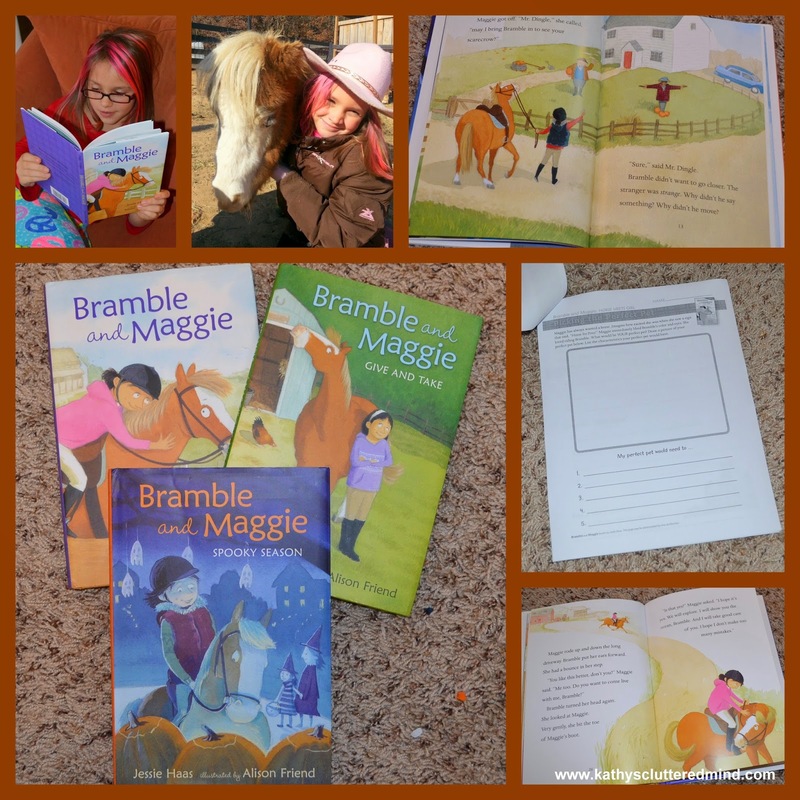 She says, "I wrote Bramble and Maggie while getting to know my new horse, Robin. Like Bramble, she has her little ways, but we are now good friends. She thinks I still have a lot to learn, though." Jessie Haas lives in Vermont. Alison Friend is the illustrator of What Color Is Caesar? by Maxine Kumin and Scrawny Cat by Phyllis Root. She also illustrates and designs greeting cards. Alison Friend lives in South Yorkshire, England. You can purchase The Bramble and Maggie books on Amazon or at your local bookstore. The hardback books are $14.99 and softback books are $3.99.